Canto Bight, the casino city on the planet Cantonica, is there another city in the galaxy like it? The novel, named after the city where there is no such thing as luck, is reminiscent of the Legends, Tales from Jabba’s Palace. However this city seems to have a brightness and high-class to it. The pre-release images reflect that and so does this novel. I always enjoyed reading those compilation style novels back in the Legends days. To be completely honest, I enjoyed these four novellas just as much — Maybe even more! The suspense and tension of these stories was almost tangible. This book was a treat. I felt like such a Star Wars fan listening to them. I wonder if that even makes sense. The Coffee With Kenobi Network will so often describe the foundation of a good Star Wars tale, as having a great story and characters we invest in early in the book. Canto Bight hooked me quick in all four stories. 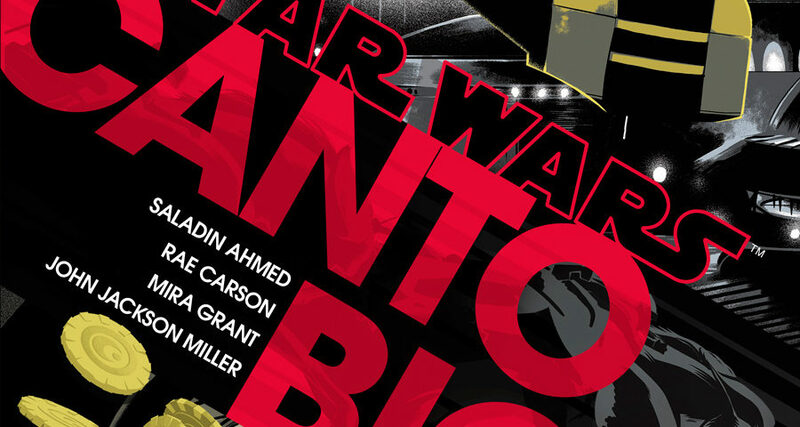 Each author, Saladin Ahmed, Rae Carson, Mira Grant and John Jackson Miller, did an amazing job bringing what we will come to know as a background character straight to the forefront. Again, knowing some deep cut, background character makes me feel like more of a fan. It is not necessary to have read this book before seeing the movie, I assume. It just makes me look forward to seeing Canto Bight on-screen. It was great to have two new voices added to the narrating family. Sean Kenin, Saskia Maarleveld did a very good job in their maiden voyage into the Star Wars audiobook catalog. While Marc Thompson and Jonathan Davis provided performances as strong as ever. There is a drive or strength about their voices. Like Miles Davis or Coltrane, you here them and you just know it’s the good stuff. There is a stability about them. I was so glad to hear new fresh voices and comforted to hear our old friends bring such excellence. Canto Bight from Amazon now. Next article CWK Coffee Break: What's in your Star Wars display case?